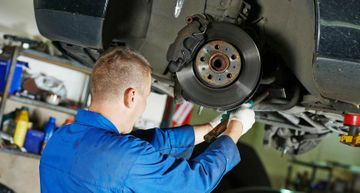 Auto Body Repair Specialists: Rely on our auto body technicians at The Collision Man to restore your vehicle’s roadworthiness with expert auto repair. Driving in the busy streets of the GTA can potentially leave a dent on your car. It could be weather damage, scratched paint or even an MVA result—no matter the cause, at The Collision Man in Oshawa, we've seen and repaired it all. Offering auto body and mechanical repairs for all makes and models, we give free and accurate estimates on our services backed by warranty. Is the engine light on again? You can count on our licensed mechanics to do thorough diagnostic testing, as well as complete car tune-ups. Our safety inspections include brake checks, exhaust systems, and air conditioning check-ups to ensure your safety. Regardless of the process, we'll make sure you have a clear picture of what we're doing with your car, so you know exactly where your money is going. Sometimes all it takes is a bumper repair or a fresh coat of paint, and other times a full restoration is needed. Make your car shine like back when you first drove it off the lot. We'll revamp your car with paint touch-ups, and we'll also get rid of any paint scratches, always aiming for precise colour alignment and lasting effect. The Collision Man is located in Oshawa, down the street from Coffee Time Shop at the corner of Ritson and Rolson. Creating strong ties within the Oshawa community, we know our customers' cars, families and friends, and we're proud to get our business through their referrals. We also help local students to get into the trade through work placement programs at our shop, where we train the next generation of car mechanics. For clients with insurance claims, we can handle the entire process - from initial assessment to repairs and safety inspections. In the end, we're all about taking good care of you, our customer! Please call The Collision Man for emergency service at our auto body and paint shop in Oshawa. Get a free quote on repairs and auto body painting in Oshawa.